A glorious and blessed feast of All Saints to you and your loved ones. We just wanted to share this beautiful excerpt from the wonderful work of Dom Gueranger, The Liturgical Year. They that have gone before us wept as they turned the furrows and cast in the seed; but now their triumphant joy overflows upon us as an anticipated glory in this valley of tears. Without waiting for the dawn of eternity, the present solemnity gives us to enter by hope into the land of light, whither our fathers have followed Jesus, the divine forerunner. Do not the thorns of suffering lose their sharpness at the sight of the eternal joys into which they are to blossom? Does not the happiness of the dear departed cause a heavenly sweetness to mingle with our sorrow? Let us hearken to the chants of deliverance sung by those for whom we weep; 'little and great,' this is the feast of them all, as it will one day be ours. At this season, when cold and darkness prevail, Nature herself, stripping off her last adornments, seems to be preparing the world for the passage of the human race into the heavenly country. Let us, then, sing with the psalmist: I rejoiced at the things that were said to me: We shall go into the house of the Lord. Our feet as yet stand only in thy outer courts; but we see thy building ever going on, 0 Jerusalem, city of peace, compacted together in concord and love. To thee do the tribes go up, the tribes of the Lord, praising the name of the Lord; thy vacant seats are being filled up. May all good things be for them that love thee, 0 Jerusalem; may peace be in thy strength, and abundance in thy towers. For the sake of my brethren and of my neighbours, who are already thy inhabitants, I take pleasure in thee because of the Lord our God, whose dwelling thou art. I have placed in thee all my desire. P.S. Don't forget. Today is a holy day of obligation. 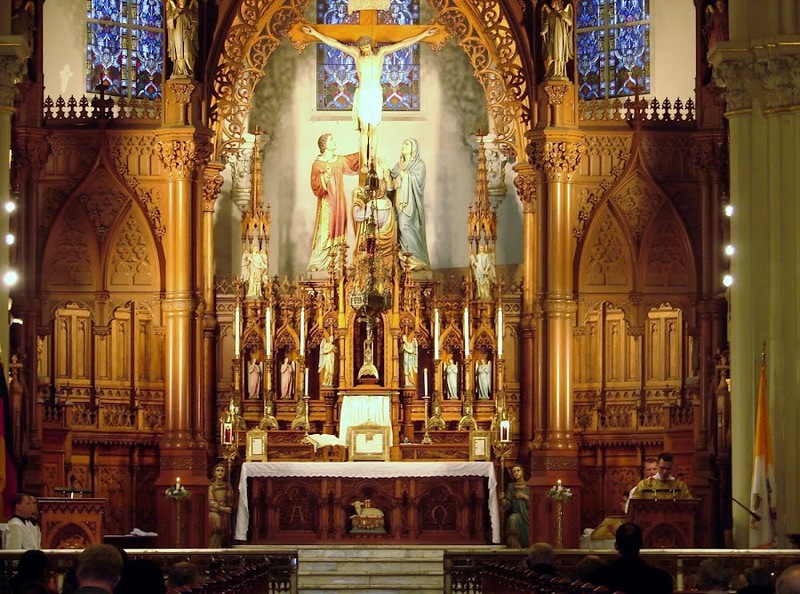 Check Upcoming Events for Latin Mass times. The schedule of Latin Masses for All Saints' Day and All Souls' Day is as follows. We are reminded that the Solemnity of All Saints is an holy day of obligation.